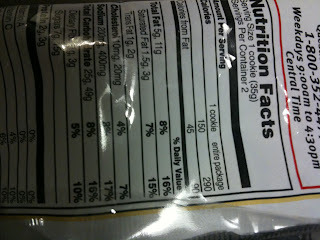 Is it necessary to give nutrition information for both "1 cookie" and "entire package"? Just give me the information for both cookies, and if I'm the kind a lunatic who could only eat one of them, I would just divide it in half. Now I'm forced to think "Gee, maybe I wasn't supposed to have eaten both. Maybe I'm just a no-will-power tub-a-lub with oatmeal cookie crumbs dripping out of her beard." And there's Nabisco standing by nodding sadly in agreement, knowingly elbowing the Keebler Elf. Whatever you jerks, it's 5:00 and I can eat whatever I want before I go to the gym.